You know how fruit salad has multiple types of fruit in it, right? Pretty much pleases everyone since there is a variety of fruit. If you don’t like one type of fruit, you can spoon up only the fruit chunks you love. Wouldn’t it be nice if there was a tree that would grow multiple types of fruit just like a fruit salad? Is there a fruit salad tree? Folks, we’re in luck. There is indeed such a thing as a fruit salad tree. What is a fruit salad tree? Read on to find out and all about fruit salad tree care. What is a Fruit Salad Tree? So you love fruit and want to grow your own, but your gardening space is limited. Not enough room for multiple fruit trees? No problem. Fruit salad trees are the answer. They come in four different types and bear up to eight different fruits of the same family on the one tree. Sorry, it doesn’t work to have oranges and pears on the same tree. The other great thing about fruit salad trees is that the fruit ripening is staggered so you don’t have a giant harvest ready all at once. How did this miracle come about? Grafting, an old method of asexual plant propagation, is being used in a newer way to accommodate multiple types of fruit on the same plant. 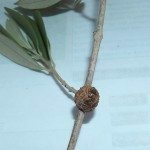 Grafting is used to add one or more new cultivars onto an existing fruit or nut tree. As mentioned, oranges and pears are too different and won’t graft on the same tree so different plants from the same family must be used in the grafting. First, you need to correctly plant your fruit salad tree. Soak the tree overnight in a bucket of water. Gently loosen the roots. Dig a hole a bit wider than the root ball. If soil is heavy clay, add some gypsum. If it is sandy, amend with organic compost. Fill in the hole and water in well, tamping out any air pockets. Mulch around the tree to retain moisture and stake if necessary. Fruit salad tree care is pretty much the same as that for any fruiting tree. Keep the tree moist at all times to avoid stress. Mulch around the tree to retain moisture. Reduce the amount of watering during the winter months as the tree goes dormant. Fertilize the tree twice a year in the late winter and again in the late summer. Compost or aged animal manure work great or use a slow release fertilizer mixed into the soil. Keep the fertilizer away from the trunk of the tree. The fruit salad tree should be in full sun to part sun (except the citrus variety which needs full sun) in an area sheltered from wind. Trees can be grown in containers or directly in the ground and can even by espaliered to maximize space. The first fruit should appear in 6-18 months. These should be removed when still tiny to allow the framework of all the grafts to develop.